Congresswoman Ilhan Omar (D-MN) was one of the wave of new progressives to get elected to the House of Representatives in 2018. Congresswoman Ilhan Omar (D-MN) has emerged as one of the three new left-wing members of Congress alongside fellow socialists Rashida Tlaib and Alexandria Ocasio-Cortez. But since taking office in January, Omar has been battling allegations that she holds strongly anti-Semitic views. The Minnesota Congresswoman continues to deny the allegations, but one tweet she sent out years ago seems to confirm the rumors. Omar was asked point-blank by the event moderator at the left-wing gathering what she had learned about anti-Semitism after some of her own past remarks had become public. The primary statement the moderator was referring to was a tweet from 2012. “Israel has hypnotized the world, may Allah awaken the people and help them see the evil doings of Israel. #Gaza #Palestine #Israel,” tweeted Omar in November 2012. The tweet remains live on her Twitter account, though Omar has since admitted it is offensive. Omar completely dodged the question about her own anti-Semitic views however. One line in particular in her non-answer stood out. “And I, I think, am at a breaking point, where we’re starting to have a conversation about what it means to be of people that harbor hate,” Omar said. 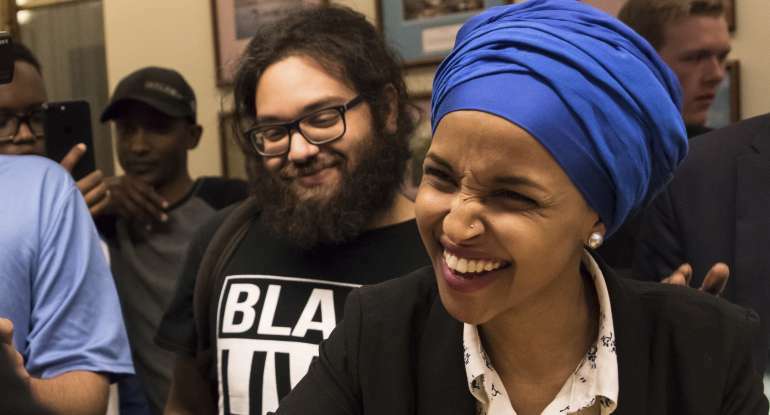 Critics immediately pointed out that Omar’s broader answer was in reference to the nation of Israel, suggesting the “people that harbor hate” which she was referring to were in-fact Jewish people. This of course isn’t the first time that Omar found herself in hot water over allegations of anti-Semitism. Last week, Fox News reported that Omar had told a television host in 2013 in Minnesota that terrorism is a reaction to America’s foreign policy, and that terrorist attacks came about because of America. That same television host had once called Israel the “Jewish ISIS” and compared the terrorist group Hamas to Holocaust victims. Omar isn’t the only member of Congress who has had to face allegations of anti-Semitism however. Her fellow progressive Rashida Tlaib (D-MI), who made national headlines after yelling that Democrats would “impeach the mother******” when referring to President Trump on the night of her swearing-in party, has since been under fire for the same things Omar now faces. Tlaib’s office had a world map which renamed Israel “Palestine”, and she backtracked on a pledge not to support the Boycott, Divestment, and Sanctions (BDS) movement against Israel shortly after winning the Democratic primary for her Congressional District. Do you think Omar and Tlaib have more explaining to do?